Pedal reviews. Roadies salivate lustfully envisioning the latest carbon/titanium contact-point lovechild. 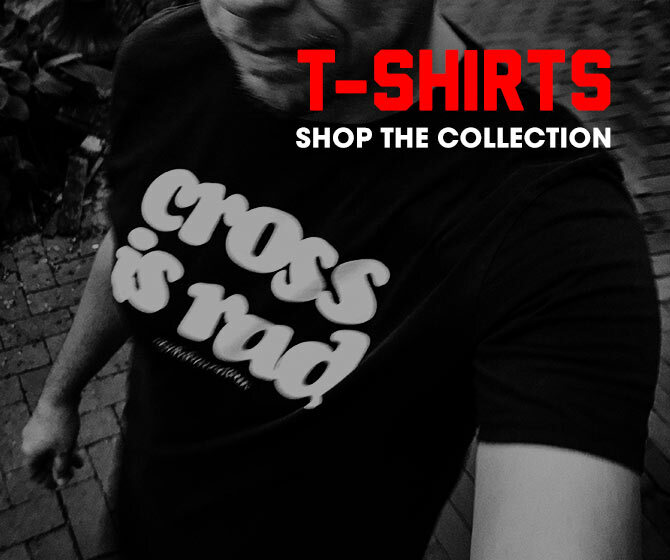 MTBers and CXers fantasize about their mud-shedding capabilities. The daily commuter thinks of… Wait, does a commuter think about pedals? 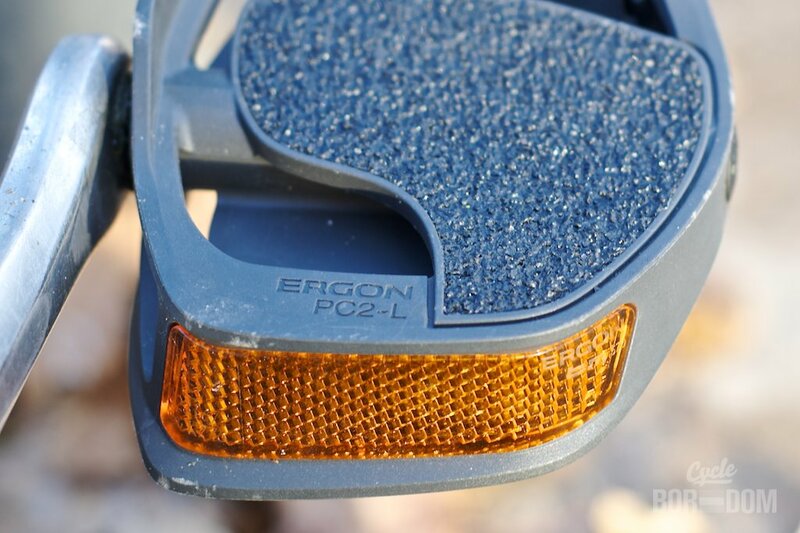 With the release of the PC2 pedal, Ergon has preemptively answered that question. Full disclosure: as a 2011 Ergon Commuter Team member I was provided these to ride and review. My review in no way is influenced by my inclusion on the team. As long as I’ve been doing the bikes, flat pedals have largely remained the same. You typically don’t give them much thought, only expecting them to do their job. The only time I think I’ve ever coveted a pair of flat pedals was while holding a pair of Suntour XC Pro Grease Guards. Ironically, that was also the time I was coveting the equally fabled Shimano PD-M737s. I chose the Japanese clipless route in the dawn of the 90’s, never looking back. Back to the point, not much innovation was pursued simply because the industry never thought it was necessary. Enter Ergon. Never one to accept the status quo, the German ergonomic accessory company decided it was time to rethink the flat. The pedals are massive. They look like giant paddles or boat pontoons where their more svelt counterparts once resided. “Massive pontoons offering sweet power-transferring solace to a wide range of feet. (pun intended)” Adding to the overall largenicity of their appearance are the thick composite sections making up its construction, and the giant dual reflectors. There is nothing small about these pedals. The major technical/selling point of the PC2 is its “anatomically contoured platform.” Set at a 6˚ angle to provide a “better joint alignment and varus (knee) angle connection.” Similarly, my road shoes are shimmed to create the same varus angle. I’ve ridden these pedals for several months, many while loaded down with groceries or pulling The Bug in the trailer—not once have my knees complained. Of course, I can’t remember the dark times before I received this enlightened device, but there’s been no new pain regardless. 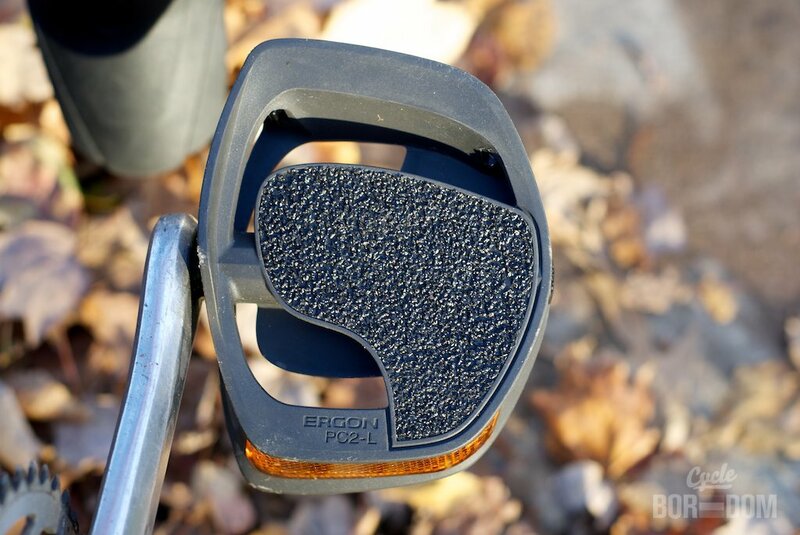 In order to create a more perfect union, Ergon has provided an inner-stop to both prevent your foot from wandering inward and to help place it intuitively. You’re obviously not obligated to place your feet in the designated ergo-zone, but it definitely helps when you’re in the “COMMUTER ZONE!” (exclaimed in Archer’s DANGER ZONE voice) When you place your feet on their massive surface you’re instantly reassured by stability. They certainly feel bigger than traditional flats, but then you realize that’s a good thing. 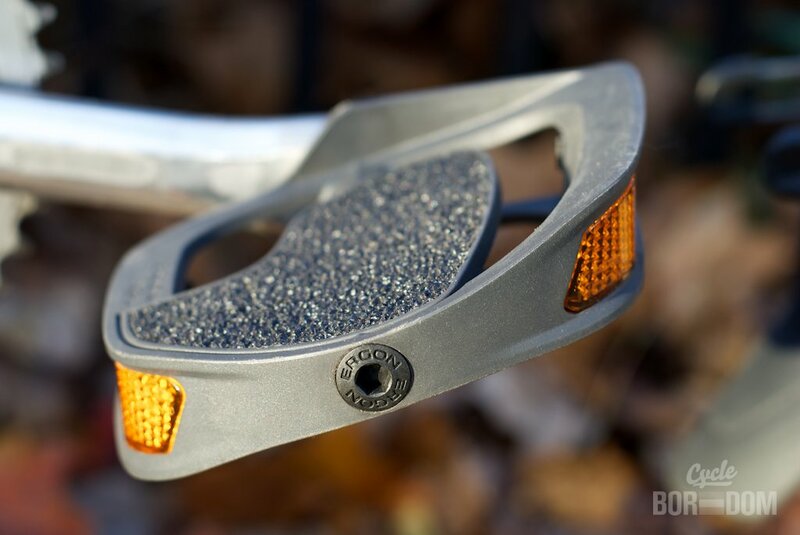 Unlike the toothy previous inhabitants, these pedals don’t gouge your shins. While not the best accolade for this product, it more than sold it for me. I noticed that I had to concentrate ever so slightly when first using them. I managed to start pedaling on the sides rather than the intended surface. Even the sides are large. That might simply be the newness of the polymer bearings, rather than a design issue. It just takes a minor mental adjustment to concentrate on how your pedals are aligned as you begin to push down. IMO this is the perfect solution for those looking to commute in regular clothes where traditional flats damage dress shoes. The surface is covered by an extremely rocky grip tape that gripped but not so hard it wouldn’t let go. In rainy conditions I noticed that my foot slipped sometimes, but it wasn’t anything alarming. Again, just a minor mental adjustment, and one that should be expected when trading out giant metal teeth that dig into your shoes. This will be a major sticking point. 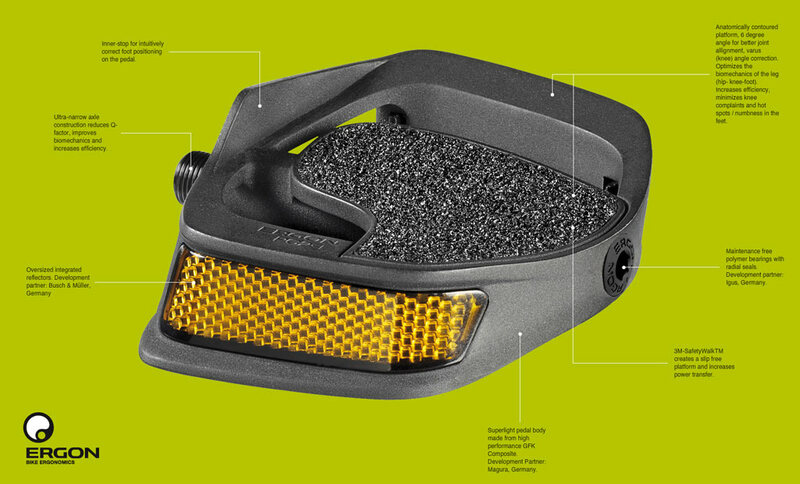 If I were to be told I’d be paying $70USD for innovative, best-in-class road pedals—there’d be no hesitation. Okay, maybe a slight hesitation since such a pedal couldn’t possibly exist. Creating a $70 top of the line road pedal is akin to unlocking the mystery of cold fusion. Back to the point, these are best-in-class, but of a class the industry no longer cared about. Cheap, bargain, takeoff pedals thrown in a basket or bottom shelf selling for only a few bucks is the competition these pedals face. However, these pedals aren’t for the “gimme the cheapest replacement” customer. The PC2 pedals are for the savvy urban commuter nattily dressing for the destination in work shoes. They’re for the rider experienced in the benefits of a clipless system and want similar power and ergonomic benefits on their city bike. They’re for those who’ve had enough of OEM and are looking for something better. Traditional flats either provide no traction whatsoever, or tear dress shoes apart—these pedals provide a solution to that dilemma. The ultimate commuter pedal is only offset by the steep price. While nearly anyone who rides a bike would benefit from the Ergon PC2, the commuter workforce travelling in plain clothes/regular shoes will gravitate towards these. OPPORTUNITES: Price, and price only.